You are here: Home / Leadership / Where Have All the Leaders Gone? His remarks at the Lincoln Memorial were not even part of his prepared text. At the time, few in the press even commented on his speaking role. But Martin Luther King’s “I have a dream” speech has become one of the most iconic orations in American history. Few understood at the time that King was poised to become one of the most effective leaders in the civil rights movement. But, when the moment was right, his preparation and willingness to follow his life’s mission enabled him to step up and make a difference. Real leaders are a rarity in our time. We have plenty of managers, but that’s not the same thing as a leader. The difference between the two is a distinction that many Americans have difficulty making. Leaders differ from managers in that they inspire those around them to do great things. Managers typically require — usually under threat of penalty — that others do their bidding, or else. Plutarch, in writing of the life of Alexander the Great, related a story of how the great conqueror’s army had traveled many miles without water. They encountered some herders who offered a drink of water to the general. But as Alexander looked at the thirsty soldiers who surrounded him, he refused to drink. Instead, he would wait until the army had found a water source where all could drink. When his troops saw this, their hearts soared and they pounded their shields and cheered. Their willingness to follow Alexander’s leadership was inspired by his willingness to suffer as they did. A manager would have simply taken the drink of water and ordered his men to move on. Another example of true leadership is found in the story of Ernest Shackleton whose ill-fated exploration of the Antarctic became a months-long ordeal when his ship became trapped in the ice. For nearly two years, Shackleton kept his 28-man crew alive in some of the harshest conditions imaginable. His leadership was notable in that he bore the burdens, suffered alongside his men, and kept their spirits high with his unflagging confidence. He took responsibility for his crew’s well-being. Scholar Hugh Nibley once pointed out that a fatal shift from leadership to management has traditionally marked the decline and fall of civilizations. Managers tend to thrive on mediocrity since they are more concerned with the privilege and control to help them maintain their status. Perhaps this is why so few people actively participate in leadership opportunities. The responsibility is more than most people are willing to bear. But the reality of life is that each of us, at some point, will be called upon to step up and lead. It may be a temporary situation or we may find ourselves in a leadership role that lasts a lifetime. But the biggest question we must face is whether we will be ready when that moment arrives. Martin Luther King’s speech 50 years ago was just a footnote to a larger event in Washington D.C. 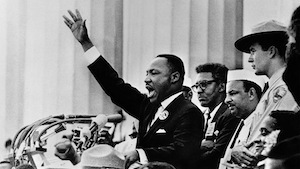 But it turned out to be a catalyst that established his leadership in the civil rights movement. He was prepared and, more importantly, he was willing to courageously step up when his influence was needed. Leadership ultimately comes down to the best use of our influence in any given circumstance. With all the various crises going on around us, the crisis that affects us most deeply at every level of society is the lack of leadership. Each of us has influence that can make the difference in matters big or small. It’s essential that we set aside our fears and be willing to say what needs to be said and to do what needs to be done without consideration for what we stand to gain. We must be prepared for the moment when our leadership is needed. 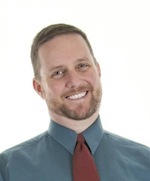 Bryan Hyde is a husband, father, disciple, teacher, guardian, reader, writer, truth seeker, stirrer of pots, radio talk show host, and PITA to those who seek dominion over others. He’s also a proud member of the Pro-Freedom Conspiracy. He does professional voice work through his company One Clear Voice. He is also a frequent and popular contributor to St. George News. Bryan and his wife Becky are raising their six children in Cedar City, Utah. Subscribe to Bryan’s blog here.